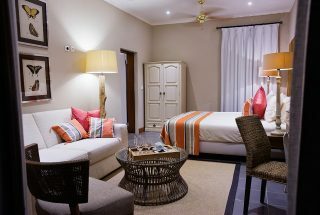 These rooms offer a variety of configuration options for individuals, couples and families (with the availability of inter-leading rooms). Wake up in the morning and be swept away by a choir of birdsong; in the evenings, be mesmerised by a striking sunset and the night sounds beneath the often-starry skies. Take a leisurely stroll through the enchanting forest, which leads all the way to the spectacular lookout point. All rooms offer luxuries including air-conditioning, personal espresso machine, amenities, satellite television & free WIFI internet. 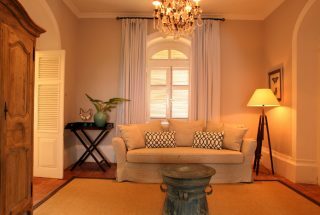 Historically the clinic and homes of the people working on the plantation, now restored to splendid and spacious rooms, these overlook the manicured courtyard and small forest towards the lookout point and bays, and offer all the grandeur and classic touches of rich plantation life. Take a leisurely stroll through the enchanting forest, which leads all the way to the spectacular lookout point. All rooms offer luxuries including air-conditioning, personal espresso machine, amenities, satellite television & free WIFI internet. 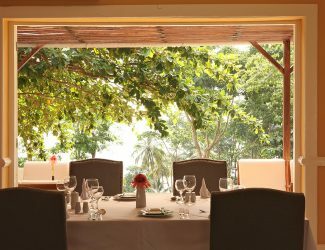 Beautifully decorated and spacious suites in a variety of locations; some with spectacular ocean and forest views; stylish courtyard suites looking out towards the stately Manor house; and yet some which are secluded and tucked away in the forest. 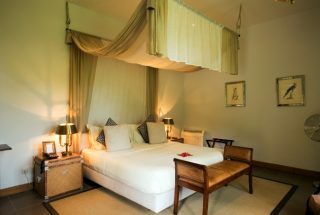 All luxury suites comprise of a separate lounge area and a private terrace opening up to beautiful views, and have generous bathrooms. All rooms offer luxuries including air-conditioning, personal espresso machine, amenities, satellite television & free WIFI internet. 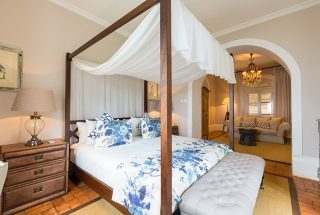 Elegant and truly magnificent, this Suite is situated in the main house and offers endless views over the incredibly beautiful Bay of Santa Rita, Praia Das Burras and Bom Bom Islet. Spacious external bathroom with shower and bath, private terrace & refreshing splash pool. All rooms offer luxuries including air-conditioning, personal espresso machine, amenities, satellite television & free WIFI internet. 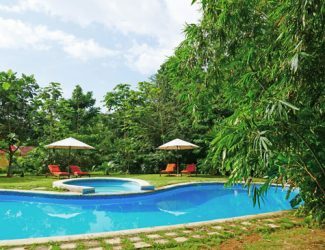 Nestled in the forest with wonderful views towards the ocean, these 2-bedroom suites are stand-alone villas, boasting a large lounge as well as outside patio with deck chairs, dining areas and the airy bathrooms are equipped with outside showers as well as inside baths and showers. All rooms offer luxuries including air-conditioning, personal espresso machine, amenities, satellite television & free WIFI internet. 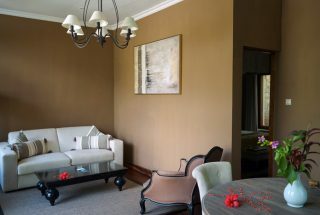 The top floor of the manor house, with two beautifully decorated suites and the addition of a separate living & dining area to enjoy family meals together and to relax and read a book from the library, or alternatively to have working meals and private meetings in a conference facility set-up. All areas offer magnificent views. All rooms offer luxuries including air-conditioning, personal espresso machine, amenities, satellite television & free WIFI internet. 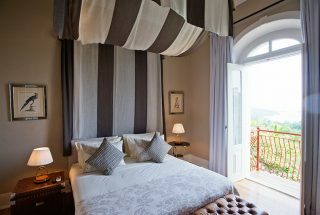 The statuesque Manor House offers 3 beautifully appointed, individual suites. 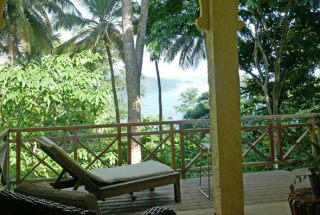 It includes a Guest Lounge with Tea Terrace that has magnificent views over the forest and bay as well as a private living room with library and conference facilities. All rooms offer luxuries including air-conditioning, personal espresso machine, amenities, satellite television & free WIFI internet. 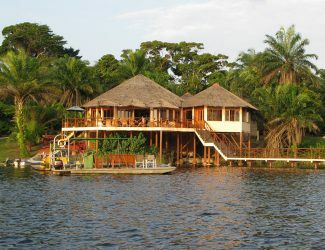 Africa’s Eden believes in the sustainable development of the regions where its operate through tourism. Based on the core concept ‘tourism pays for conservations’, our goal is to conserve the pristine nature. 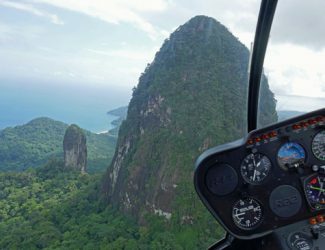 Profits generated by Africa’s Eden are reinvested in the area to ensure the continuity and economically sustainable protection of the national parks.